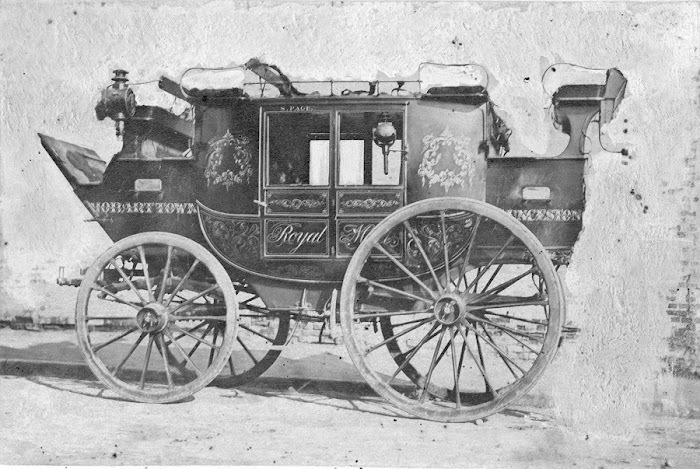 Samuel Page held the government contracts for the Royal Mail coach deliveries between Hobart and Launceston, and contracted T. J. Nevin for photographic advertisements of his coachline. 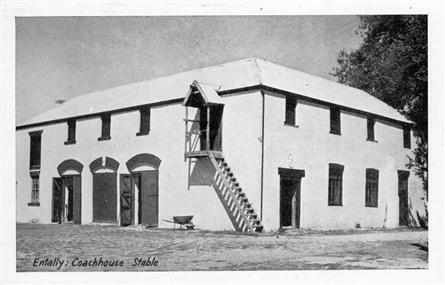 Samuel Page lived at Belle Vue, New Town, a villa with stables, paddocks and gardens. 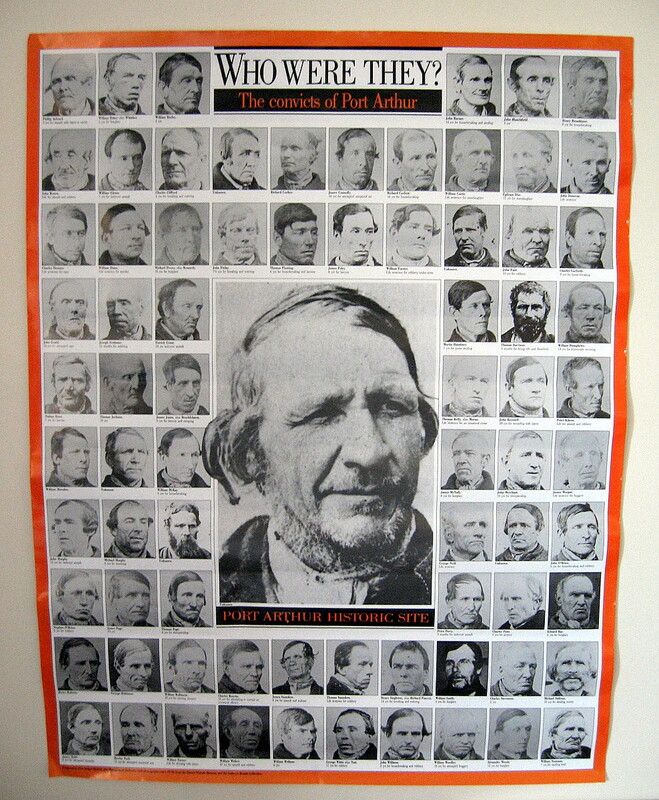 He transported prisoners under government contract from regional stations and courts to be “received” at H.M. Gaol, Hobart, accompanied by constables. 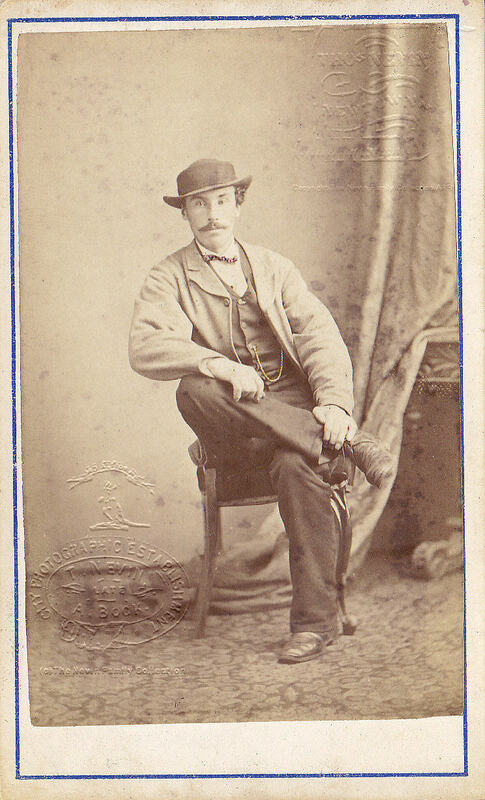 With Samuel Page’s patronage, Nevin travelled between Hobart and Launceston, combining commercial photography for Page, and police photography for the Municipal and Territorial Police. Top: Original photo by T.J. Nevin with the figure of Tom Davis and Burdon’s company name painted out (QMAG Collection). Below:Original photo by T.J. Nevin with the figure of Tom Davis and Burdon’s company name visible (TMAG Collection). and a new Chaise Cart. The company name “BURDON’S … COACH MANU-FACTORY” is visible in this, the unpainted original by Nevin, as is the figure of Tom Davis. The photograph is held in the TMAG Collection and featured in the TMAG video of railways and coaches, Railway Station Hobart. 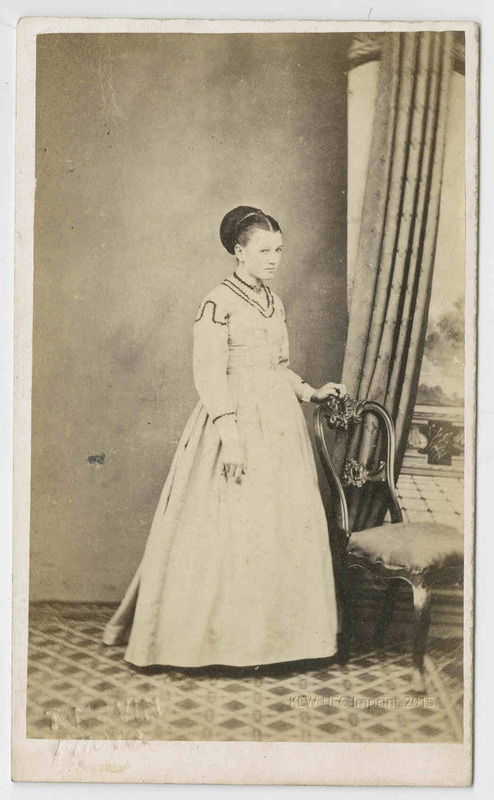 This photograph may not be the only one taken by Nevin for Page’s coach line, as earlier researchers in the 1980s noted that several trade advertisements by Nevin were extant in public collections, but this is the sole example made available online, dated 1872. The verso is not visible at the QVMAG website, and given the attribution, it probably bears one of Nevin’s studio stamps. 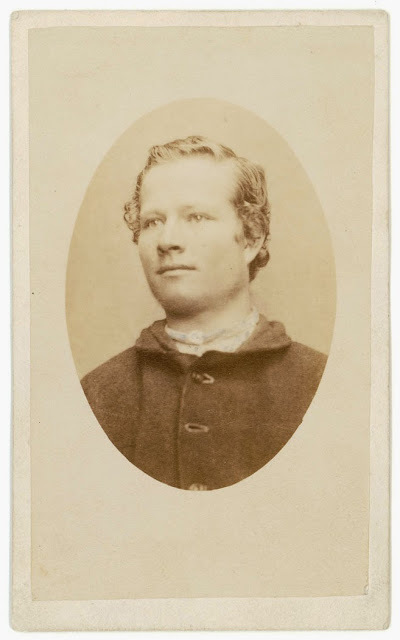 The catalogue entry notes for the verso handwritten inscription that either the untouched original was held at the property called “Entally” or that it is a copy of the same photo held at Entally which had been altered to eliminate the figure of Tom Davis, the coach maker. The area to the viewer’s right of the coach bears clear evidence of a man’s figure painted over. 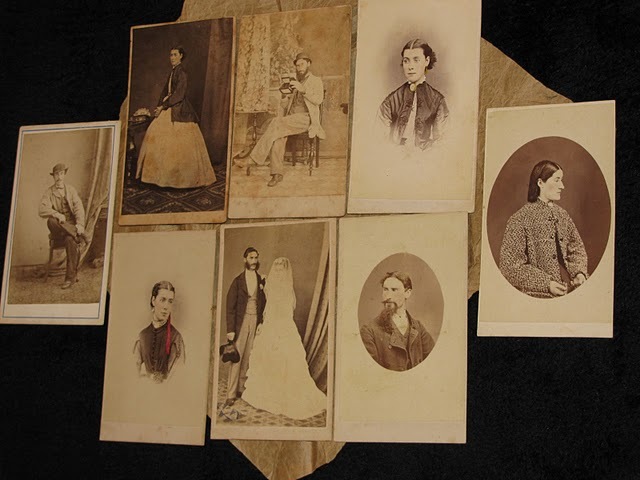 This item is yet another example of an original photograph taken by Nevin with a provenance from a Northern Tasmanian family which bears evidence of paint subsequently applied by his client(s). See these examples held at the QVMAG, at the State Library of Victoria, and in the Private Collection of John McCullagh. View of the Hobart to Launceston coach, 1872, Tasmania. PAGE’S LINE OF DAY AND NIGHT COACHES ____ FURTHER REDUCTION OF FARES BY MAIL ____ On and after FRIDAY, 17th January instant, the Fares will be REDUCED as under- mentioned: – DAY AND NIGHT COACHES [etc etc]. 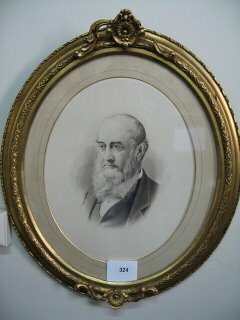 PAGE, SAMUEL (1810-1878), publican, coach proprietor and pastoralist, was born on 30 March 1810 in London, the second son of George Page of Bermondsey, and his wife Sarah. 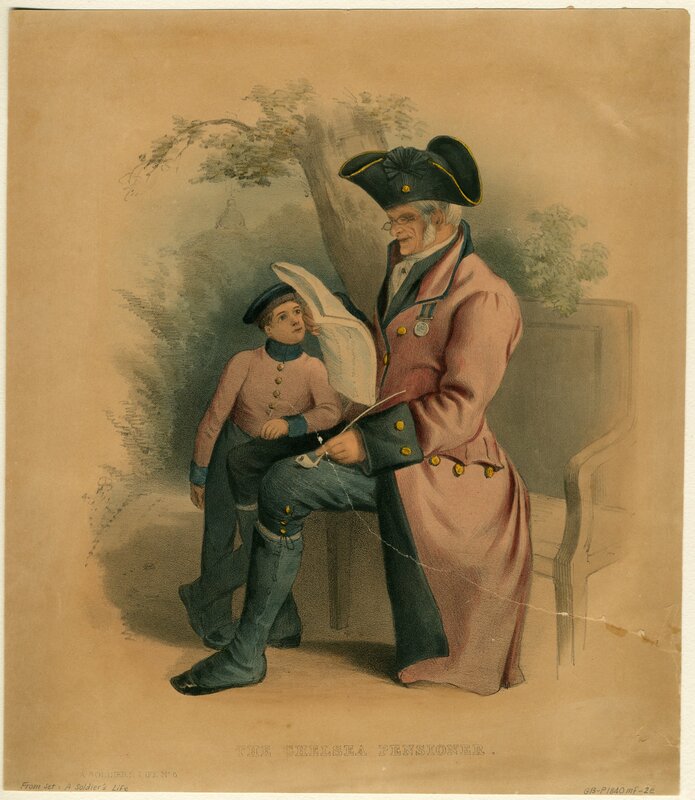 His father, a Waterloo veteran, arrived in Hobart Town in January 1822 from England in the Tiger, settled at Bagdad and was later granted land at Lemon Springs although he claimed to have migrated without a shilling. His wife and three children, Samuel, John and Louisa, arrived in Van Diemen’s Land in the brig Belinda in November 1823. On 19 September 1833 at Hobart Samuel Page was married to Grace, daughter of Captain Harris, a master mariner. In 1835 he was granted the licence of the Glasgow Wine and Spirits Vaults at the north-east corner of Elizabeth and Liverpool Streets in Hobart, and two years later took over the Lake Dulverton Inn at Oatlands. In 1839 he moved to the Oatlands Hotel. With John Lord he became a coach proprietor in 1848. Next year he bought from the widow of John Edward Cox a coach service that had run between Hobart and Launceston for seventeen years. In 1853 Page took over the mail contract and after six years bought out John Lord for £8750. With three coaches daily each way, the service controlled most of the transport on the main road and required 300 horses and three main fodder stations. Fares ranged from 5s. for outside seats to £5 inside. 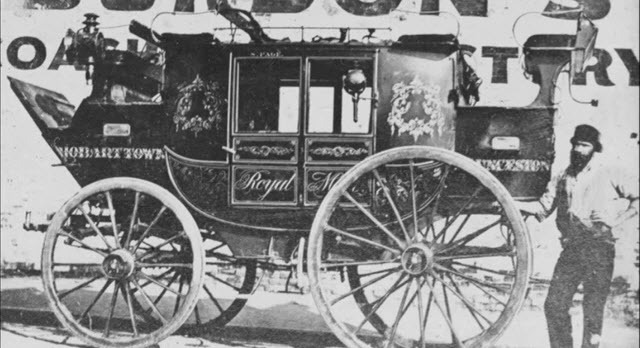 Each mail coach carried an armed guard, and two when bullion was aboard. 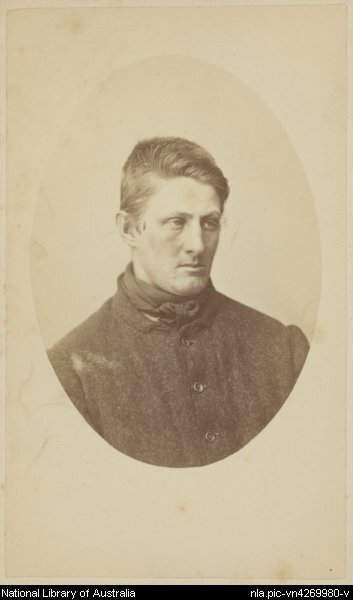 Although the service was never held up by bushrangers, Page himself was once stopped in Epping Forest by two of them, Ogden and Sullivan; he refused to take them seriously and was allowed to pass on, chiefly, he claimed, because one of them had worked for him. A more serious challenge came in 1873 when Alfred Burbury started a rival coach service, but within three years Hobart and Launceston were linked by railway. During his coaching operations Page acquired many pastoral properties, including Northumbria, Anstey Barton, Woodlands, Kelvin Grove, Trefusis, Ellenthorpe, Stonehenge and Mount Vernon. At one time his landholdings and his flocks of 63,000 sheep were said to be the largest ever held by one person in the colony. 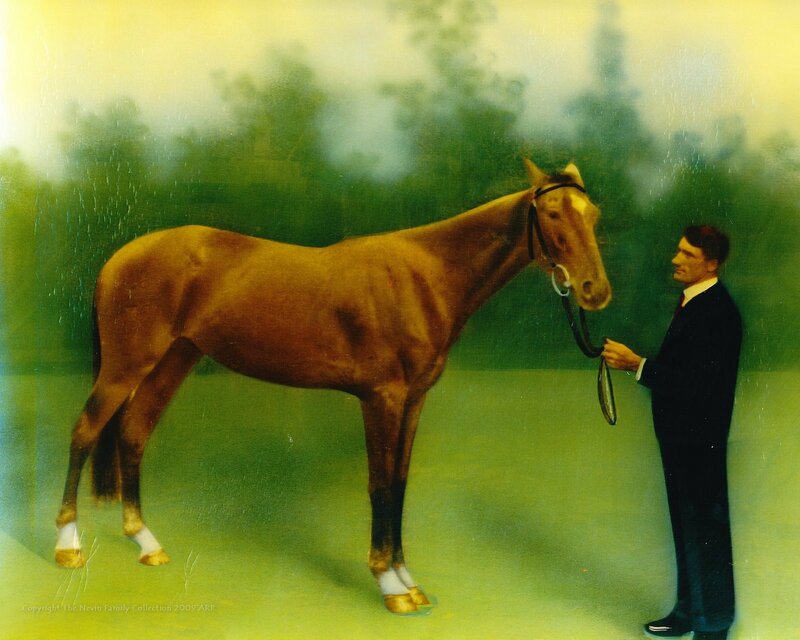 Page was an enthusiastic breeder of race-horses and, with Sir James Agnew and James Lord, he helped to found the Tasmanian Racing Club in Hobart. He died at Hobart on 31 March 1878, and his widow on 9 August 1882. Of their four sons and six daughters, Alfred ran a stud farm at Melton Mowbray on a portion of Woodlands. 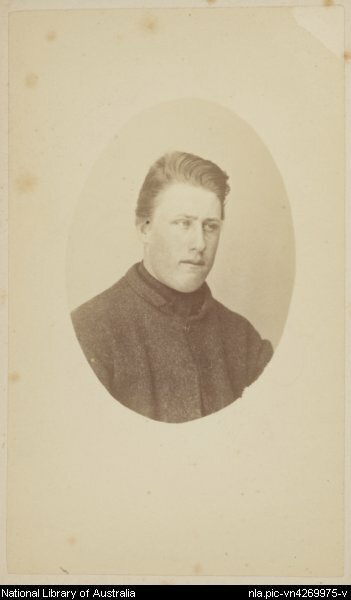 Alfred’s son, Charles Service Page, followed in his father’s and grandfather’s footsteps and served for twenty years on the committee of the Tasmanian Racing Club. Print Publication Details: C. A. S. Page, ‘Page, Samuel (1810 – 1878)’, Australian Dictionary of Biography, Volume 2, Melbourne University Press, 1967, p. 308. Page’s Royal Mail Coach operated passenger services between Launceston and Hobart carrying approximately 17 passengers per trip. A timetable of coaches appears in Walch’s Almanac. The company was established in 1848, and until the 1870s was one of the main operators in Van Diemen’s Land. 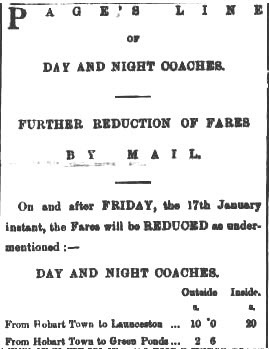 With the completion of the Tasmanian Main Line Railway from Hobart to Launceston in 1876, travel time was reduced from 14-15 hours to seven and the use of the coach service declined. 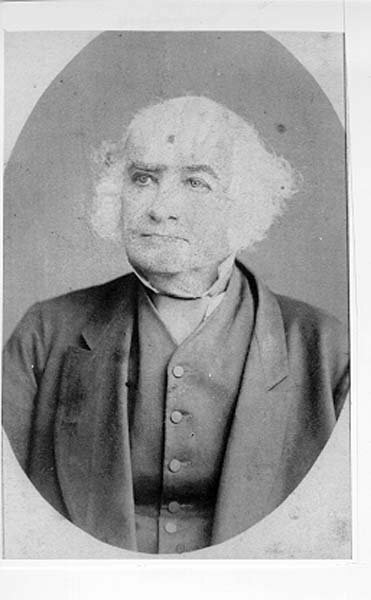 Samuel Page died on 31 March 1878. Walch’s Tasmanian Almanac, 1875, p. 132, 144. Tasmanian Archive and Heritage Office, Correspondence file under Samuel Page. The Companion to Tasmanian History, 2006, ‘Engineers and Engineering’. C. A. S. Page, ‘Page, Samuel (1810 – 1878)’, Australian Dictionary of Biography, Volume 2, Melbourne University Press, 1967, p. 308. 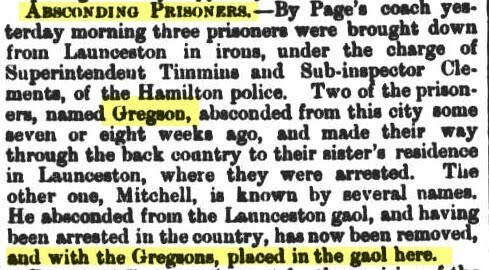 Page’s coach line conveyed prisoners in irons, accompanied by constables such as Constable John Nevin, Thomas Nevin’s brother and photographic assistant, from Launceston and regional lock-ups to the Hobart Gaol. 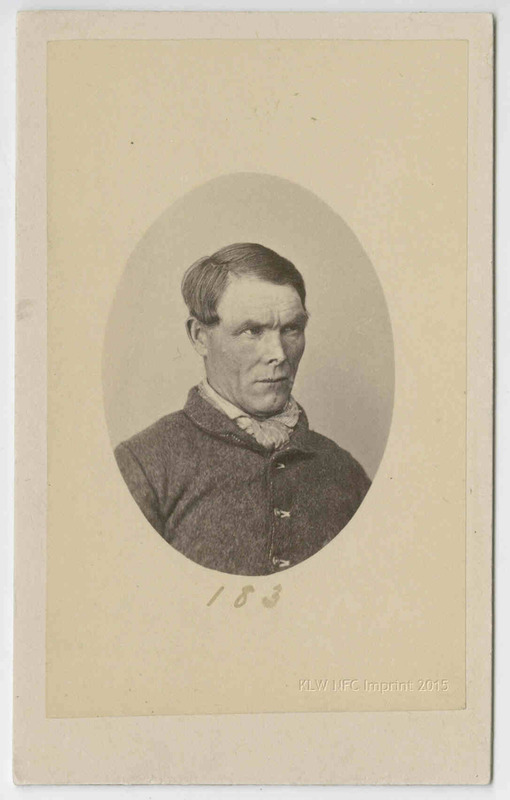 Other photographs by Thomas J. Nevin held at the Queen Victoria Museum and Art Gallery are the collection of Tasmanian prisoners 1870-1879. 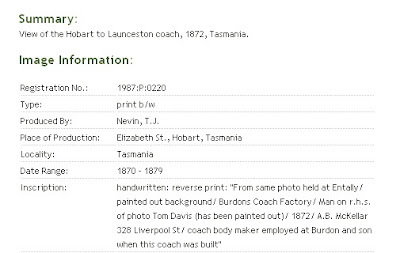 THE ORIGINAL PHOTOGRAPH of the coach is featured in the TMAG video of railways and coaches, Railway Station Hobart.